Tracklist here: http://www.factmag.com/2014/11/10/fact-mix-469-outboxx/ -- Bristol's best young house duo flex their muscle. 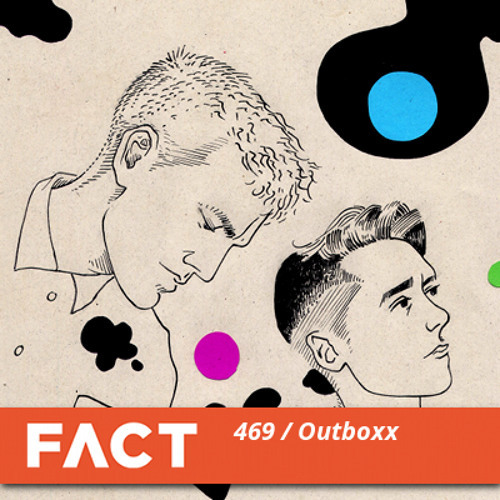 There's nothing spectacular about the Outboxx story: it's simply two great, young producers (Jacob 'Hodge' Martin and Matt Lambert) releasing a steady stream of excellent singles, and in 2013, an excellent debut album. It is a timely tale, however: the duo seemed to emerge in tandem with Bristol's shift from a city focused on dread and sub-bass to house and techno, with Chris Farrell's Idle Hands taking over from Peverelist's Rooted Records as its key record shop. Of course, things are never quite that black and white, but Outboxx's embrace of the lighter side of house (although their music is never fluffy, it does relish dreamy atmospherics, nimble grooves and the odd hands-in-the-air moment) does seem to match up perfectly with Idle Hands' arrival on the scene, and it's no coincidence that the store's in-house label has released several of Outboxx's 12"s, as well as their debut album. They're happy to spread the love, though, and Outboxx productions have recently been housed on Futureboogie, Local Talk and, most, recently BRSTL, with a new single out this week. Outboxx's FACT mix slips by like a dream, packed with piano leads, wompy basslines and rushes of 909 hats. Sure, it's nothing that hasn't been done before, but few are currently doing it better. Dilla, Genius of Time, Leon Vynehall and more feature. oh yeah that is THE one! Track ID please. It's great! @daze: Sold out everywhere so I bought a mint copy on Discogs from a US seller, thank you! SO HOT! That is so hot who is this?!? !